The new APM 152-1200 Doublet is a mold breaker in the 6″ Refractor category. We have painstakingly engineered an optical and tube solution to bring you APM quality at an unheard of price. The new 152-1200ED features a Doublet lens cell using ED glass equivalent to FPL-51 complimented by a Lanthanum coated element to maximize performance. Our innovative combination of materials and design has resulted in optical performance far beyond the norm for a telescope of this price. As with all APM telescopes consistency is assured and each telescope goes through an interferometric test at the 532nm (green) wavelength before shipping. With a generous 1200mm focal length, the 152-1200ED is an impressive all-rounder. From intricate double star observing to high contrast detailed planetary views, this new scope will introduce a whole new group of Astronomy enthusiasts to APM quality. The 152-1200ED is also supplied with extensive accessories. 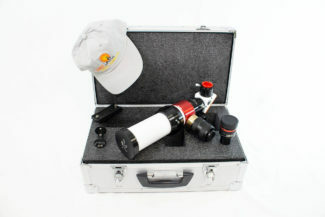 Inside the quality Aluminum transport case you will find not only a fantastic value telescope but also a newly designed 2.5″ focuser, CNC tube rings incorporating a carrying handle, 330mm Losmandy style dovetail and finder bracket. Traditional APM quality has been applied in all areas. The new 2.5″ focuser is a Rack and Pinion type, with 1:10 focusing. It remains rigid under high loads making it suitable for imaging. The attention to detail extends to areas like the 2″ and 1.25″ eyepiece adapters. These use a new design of collar clamp, far superior to the common brass compression rings found on lesser designs. Of course, if you would like to use a Starlight Instruments Feather Touch (model FTF3035B-A) then this can be supplied as an option, for that reason the tube end has a thread M109 x 1 and M95 x 1 to accept a 3″ or 2.5″ Starlight focuser. Imaging accessories for the 152-1200 include a 2.5″ (Order Nr. TSFlat2.5) field flattener which maintains focal length. There is also a dedicated Massimo Riccardi designed APM Reducer (Order Nr. APM-RIRED152-1200S-2L or APM-RIRED152-1200-2L). This changes the focal length by a factor of x0.75, resulting in a 900mm focal length and fast f5.9 aperture. With the new 152-1200ED we believe we have created an Apochromatic Refractor of incomparable performance and value in its category.